Jehovah's Witnesses Supplies and Services - Products Made and Sold by The Friends Around The World. 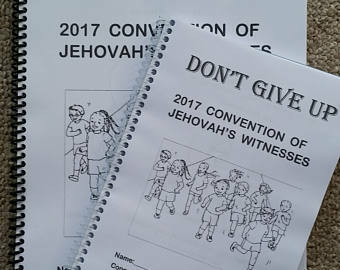 Included in this 59 page notebook, is an easy to follow program and an extra feature I included is a "What Do You Remember?" revision page that you can do together for your next Family Worship. Custom Bookbinding – For all our publications. In Wisconsin. Organizer Systems – Bible binding and field ministry supplies. Service Supplies – Products for your ministry. In California. Pioneer Service Supplies – Products by pioneers. In the United Kingdom. Bennett Cards Ltd – Theocratic Products. In Britain. Bethel and City Tours - Transportation services for Jehovah's Witnesses, their families and friends. We provide services from NYC to visit Watchtower Bethel in New York. Bethel Tour. Bethel Tours – by Illinois International Travel. Meander Travel – British Museums and Bible Lands. JW Tours – For brothers by brothers, in Britain. Remote Mast – Since 1988 when we introduced Remote Mast individuals and Organizations world-wide have expressed appreciation for this well built device that simplifies the height adjustment of microphones and other equipment. KZWeb – Connect to Kingdom Hall meetings by installing a dedicated server. 6th Avenue Concepts - Freelance graphic designer with over 20 years experience. Jah-Jireh Charity Homes – Assisted living and health care for elderly and infirm brothers and sisters in England and Wales. House2House – A theocratic board game. Strictly Genteel – Collection of older, out of print and out of copyright publications. Brothers and Sisters on Etsy?